Assistant Professor Melissa Martinson's research focuses on inequities in health and wellbeing throughout the life span, both in the United States and internationally. In particular, her work examines the wide health divide between the United States and other wealthy, developed nations. Within that comparative context, Dr. Martinson's research aims to understand and alleviate health disparities by race and ethnicity, socioeconomic status and immigrant status. Dr. Martinson's interest in the international comparative aspects of health and wellbeing began when she was a social worker in child and family services in London, UK. This experience continues to inform her research examining health and health disparities in a comparative context. Her current research projects focus on cross-national comparisons of health inequalities by race/ethnicity and socioeconomic status, the health of immigrant children, and the influence of timing of arrival on immigrant health. 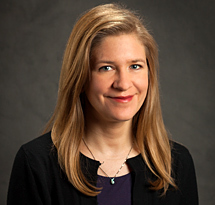 Dr. Martinson received her master's in social work from the University of Minnesota and her doctorate from Columbia University before completing a postdoctoral fellowship at Princeton University's Office of Population Research. Her work has been published in the American Journal of Epidemiology, American Journal of Public Health and Social Science and Medicine. Dr. Martinson teaches courses on health and policy practice and is an affiliate at the University of Washington Center for Studies in Demography and Ecology. The US Health Disadvantage in the Early Life Course: A comparison of cardiovascular wellness in the United States, England, Canada, and Australia.